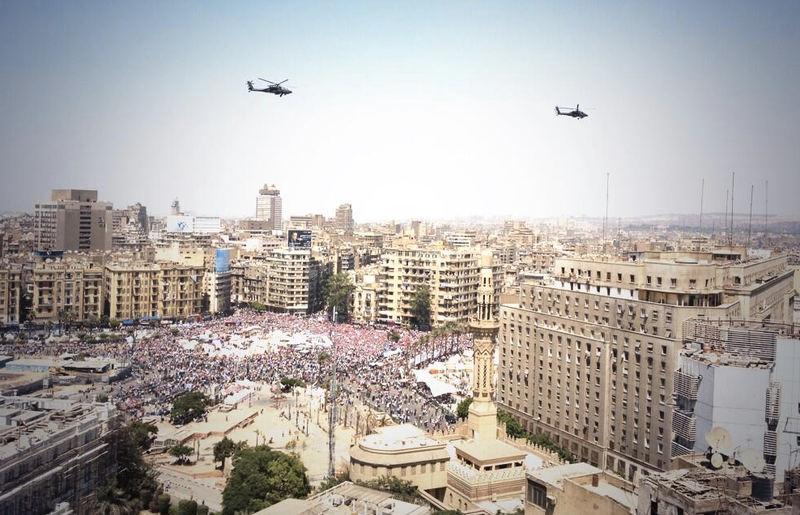 Egyptians in Tahrir Square and across Egypt have erupted in cheers following the Military’s statement. In a televised address, Egypt’s Minister of Defence, Abdel Fattah Al Sisi, declared that the President has 48 hours to respond to the demands of the Egyptian people. The Minister added that if the time expires and the Minister has not responded to the demands, then Egypt’s Armed Forces will have the duty to intervene. The Minister started by stating that the Armed Forces will not be a party in politics or leadership, but that the continued atmosphere threatens Egypt’s society and the people. However, the Minister also clearly stated that the Armed Forces will not rule the country, and will instead create a road map in cooperation with all parties, and especially the Egyptian youth, to create a government that represents all Egyptians. Up to 20 million Egyptians had occupied Egypt’s streets yesterday in what was dubbed the “largest demonstration in the history of mankind.” The protests had been organized by the Tamarod (Rebellion) Campaign, which had gathered more than 22 million signatures in support of withdrawing confidence from President Morsi. 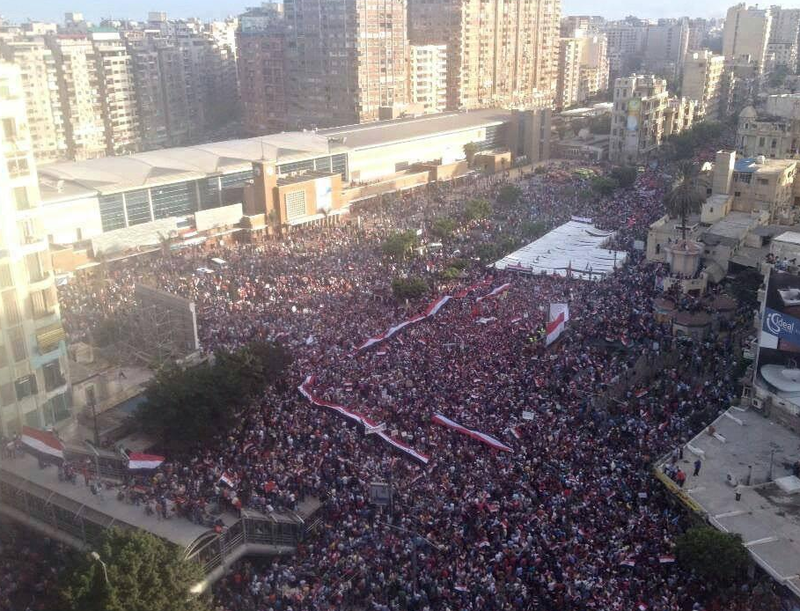 Protesters in Egypt’s second largest city, Alexandria. Egypt’s health ministry stated that at least 20 had been killed and 900 injured since Sunday morning. Outside the Muslim Brotherhood’s Guidance Bureau, at least five were killed, with three suffering gun shot wounds. Images and video showed individuals from within the Guidance Bureau firing at Anti-Morsi protesters that had gathered outside the building amid attempts to torch and storm it. Four were killed outside the headquarters of the Muslim Brotherhood in Assiut in clashes between opponents and supporters of the President, while one was killed in Alexandria and 298 injured in the port city. Beni Suef, Kafr El Sheikh, Beheira, Fayoum and Gharbiya all witnessed at least one death each and multiple injuries. Despite the deaths, the atmosphere in most of Egypt’s streets remained largely peaceful, festive and jubilant amid chants calling for the downfall of the Muslim Brotherhood and President Morsi. 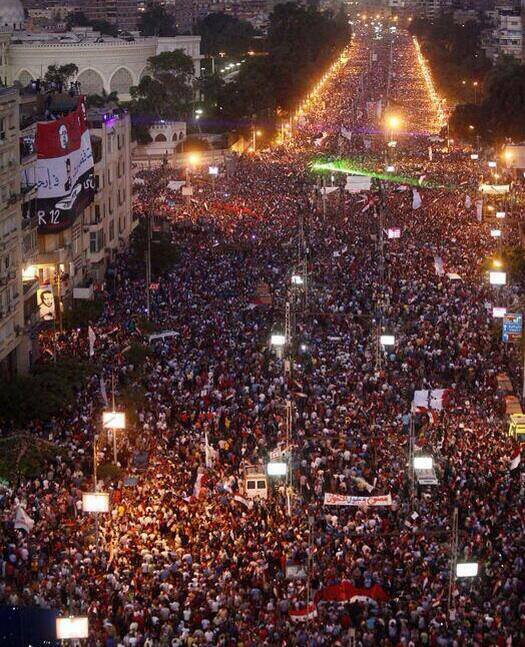 At the Presidential Palace, analysts claimed at least one million Egyptians gathered to protest against the President. Throughout the day, the Presidential Guard were witnessed giving out water bottles to Egyptian protesters who had been standing in the scorching heat of Cairo’s summer.